Help young people stand strong against atheistic evolution! A shockingly high percentage of kids brought up in the church will end up walking away from their faith, never to return. Why is this happening? In a word, evolution. This is what your children and grandkids are being taught, and it’s what they end up believing – even if they attend Sunday school every week. What can Christian parents, pastors and youth leaders do to help young people say “NO!” to the evolutionary propaganda from their culture, their peers and their teachers? 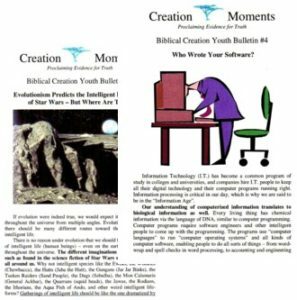 A great way to begin is withFREE Biblical Creation Youth Bulletins from Creation Moments. Intended for readers of High School age and up, the bulletins will help young people think the issues through … from a biblical viewpoint. Simply click on any of the links below to open a PDF document which you or your church can print, duplicate and use in Bible studies, youth group meetings and more. Follow the instructions on your printer to produce a 2-sided copy. To save money on the cost of color ink, print them out in black-and-white. Evolution Has Promoted Racism – Though evolutionists don’t like to admit it, Darwinism is a philosophy that has given birth to racism. See how Darwinism’s belief in “sub-human” races led to dictators like Hitler and resulted in the slaughter of millions of people. Evolutionism Predicts the Intelligent Life-forms of Star Wars – But Where Are They? – Scientists are tirelessly looking for intelligent life forms throughout the universe. Are they likely to find intelligent creatures like those in Star Wars? The fact is – there really is an Extra Terrestrial Intelligence … one that evolutionists don’t want to find! Check Before You Wreck – No one has actually observed or witnessed evolution, yet it is dogmatically taught as fact. See how attempts to study evolution have failed to produce any real evidence in spite of multiple efforts. After examining the evidence for yourself, you may conclude that evolution is nothing but a “cunningly devised fable”. Who Wrote Your Software? – The chemical information inside the DNA molecule can be read like a book and is used to run biological “operating systems”, enabling us to breathe, digest food, move and think. How did this information get there? Evolutionary scientists are baffled, but the Bible has the answer. When You Assume… – To hear evolutionists tell it, biblical creationists are guilty of making assumptions, irrational thinking and circular reasoning. The truth is that evolutionists are guilty of all these things. In fact, Darwinism is built on a foundation of assumptions that contradict actual scientific and historic evidence. 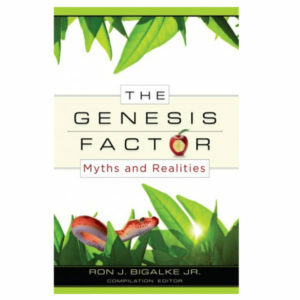 Churches and parents are permitted to copy and distribute these Biblical Creation Youth Bulletins but not to sell them. Though this valuable resource is free, Creation Moments would appreciate it if you’d ask the Lord how He would have you support our ministry so we can continue to produce resources like this. To make a tax-deductible donation, please call us during regular office hours at 1-800-422-4253 or make a donation online. Thank you and God bless you!